A group of Transportation Design students at the l'Istituto Europeo di Design (IED) in Torino have presented a tribute to the reborn Abarth brand with their interpretation of a small, 2-seater sportscar to carry the famous 'scorpion' logo. Dubbed the "Abarth SS", this interesting design project immerses itself in the long-standing Abarth tradition which has now been revived by Fiat with the official re-launching of the brand at the Geneva Motor Show in the spring. This is the second Fiat-derived small two seat concept sportscar to be presented this year, also in Geneva design house Bertone unveiled a well-received Panda-based 'Barchetta'. The IED has a long standing tradition of creating full scale concept cars which are shown at the Geneva Show: this year is presented the 'sporty off-road' beON model in the halls of the Swiss Palexpo, and in recent years the Transportation Design course students have show a Lancia-themed concept car, the Haizea (2006) and the year before the Fiat X1/99, an idea that drew on the famous little Fiat X1/9. 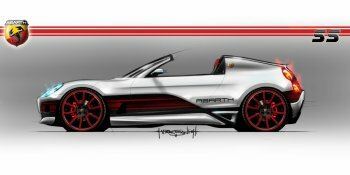 In fact the Abarth SS sketches reveal thinking drawn from the X1/99 concept car, which was a well thought out project with an innovative mechanical stowing solution for its retractable roof. The new 'Abarth SS' project has been undertaken by Matteo Bergantin, Michele Cito, Andrea Corona, Alex Mastinu, Giulio Partisani and Satoshi Shiina, all of whom are students on the IED's Transportation Design course. Dubbed the "Abarth SS", this interesting new IED design project immerses itself in the long-standing Abarth tradition. The new 'Abarth SS' sportscar design project has been undertaken by IED students Matteo Bergantin, Michele Cito, Andrea Corona, Alex Mastinu, Giulio Partisani and Satoshi Shiina. A group of Transportation Design students at the l'Istituto Europeo di Design in Turin have presented a tribute to the reborn Abarth brand with their interpretation of a new small, 2-seater sportscar. 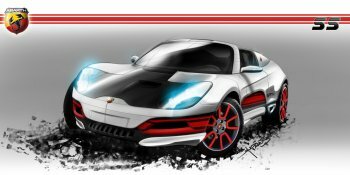 The students envision a small sportscar of length, 3.55m, width, 1.68m, and height, 1.20m, and powered by a normally-aspirated 100hp 1.4-litre engine or the new 150bhp turbo unit destined for future Abarth-branded Fiat models, while a price of around 18,000 euros in suggested. For forty years, the Istituto Europeo di Design has been operating in the fields of Education and Research in the disciplines of Design, Fashion, Visual Arts and Communication. Today it is an international network constantly on the growth. The scope of the Istituto Europeo di Design is to offer young professionals the most efficacious tools necessary to answer the constantly evolving demands of the production world: a project and communication culture that will accompany them throughout their careers. Since its inception the IED has trained in its locations (Milan, Rome, Turin, Madrid, Barcelona and San Paulo in Brazil from February 2005) 70,000 students who have come from 85 different countries. Every year, in Italy, more than 1,600 foreign students attend IED courses. The Turin facility is home to the Transportation Design course. Thanks to its territorial growth, the IED plays more and more the role of Culture and European Design Projects Ambassador participating in numerous countries in cultural, economic and environmental issues and organising exhibitions on "Made in Italy" and Italian Design, realised both in Italy and abroad. While the Abarth SS currently remains just as a styling project, following the IED's recent tradition of realising well-presented full-scale concept car projects, there must be a strong chance that this path will now be followed, allowing a clear look at one potential future solution for Abarth brand to develop an own branded standalone product.